Ambassador David Friedman says Trump's Middle East peace plan will be revealed 'in a few months'. 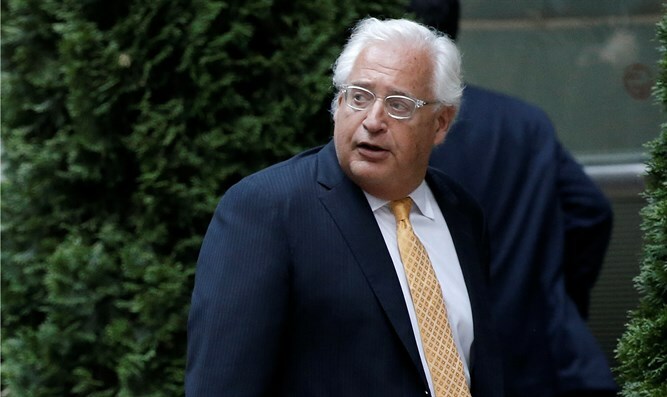 American Ambassador to Israel David Friedman has confirmed that the Trump administration is preparing a Middle East peace plan, which it hopes to launch “in a few months”. On Saturday, The New York Times published a report claiming that the Trump administration was currently in the process of drafting a peace plan for the Middle East, with the aim of helping Israel and the Palestinian Authority reach a comprehensive final status agreement. A day later, a senior Israeli official told Arutz Sheva that the framework for a peace deal now under consideration by the Trump administration was nowhere near completion. "The US administration's peace plan is still far in the future," the source told Arutz Sheva, adding that "the administration is in an advanced stage of the process, but they have already understood that the situation here is much more complex than initially thought." But on Monday, JNS published comments from US Ambassador to Israel David Friedman confirming the Times report, adding that Trump’s peace plan would be unveiled within a matter of months. According to former White House Press Secretary Sean Spicer, the Trump administration has grown increasing interested in pursuing a final status agreement between Israel and the PA.